Maurice and Vijay are thrilled to be the only grade nine students to make the junior football team. But it soon becomes clear that their coach, Bob Jones, who has just been elected mayor, has his own reasons for giving his two new players preferential treatment. Massive media coverage of the outspoken Coach Jones starts turning up allegations of illegal behaviour, including use of crack cocaine. And the ego-driven competitiveness that won Jones the mayor’s office fuels his abusive coaching style. But Jones has many dedicated supporters, including Vijay’s father, who say Jones cares about the little people and credits him with saving his football players from a life of drugs and gangs. Maurice and Vijay finally decide that they’ve had enough. But can they get the rest of the team, especially the older players who resent them as “minor niners,” to help them take control from the man the whole world knows as the Crack Coach? 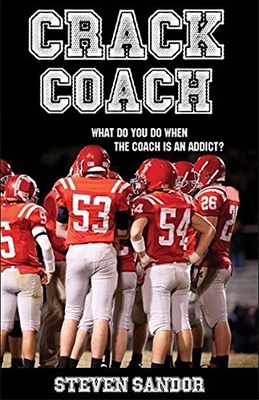 While based on a situation taken directly from the headlines, Steven Sandor offers a compelling and entirely fictional story that explores what happens when young players strive to take action that addresses an unexpected and destructive issue rather than waiting for adults to face up to the problem.